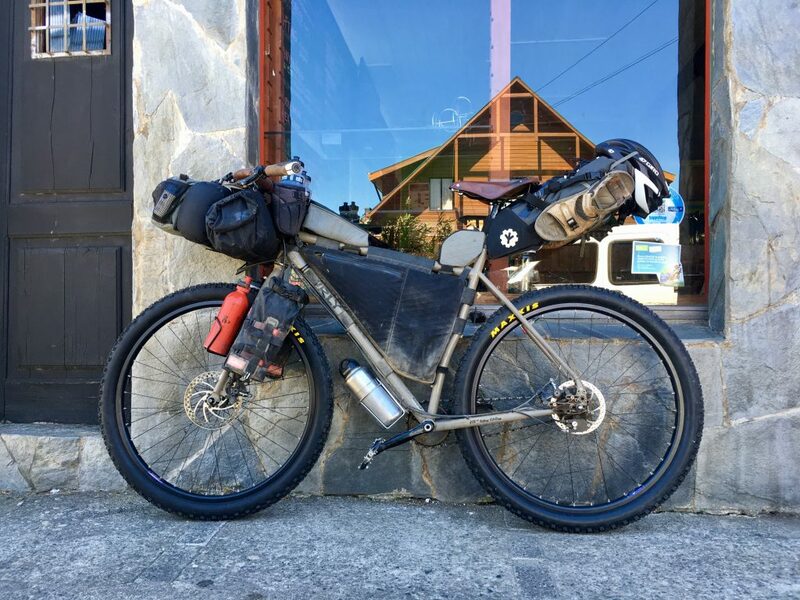 When I first researched this trip and started to spec up my bike, I was heavily influenced by the likes of Cass Gilbert (While Out Riding) who had blazed a trail through South America a few years earlier, slowly evolving their setups and embracing a growing scene called ‘bikepacking’. This approach is essentially all about minimising your kit and attaching it to the bike in a way that allows you to ride in a ‘freer’ manner than that of a traditional touring setup (with two or four large panniers). In particular, it really opens up opportunities for riding more challenging dirt-road or off-road routes and, where necessary, to ‘hike-a-bike’ (literally carry your bike). 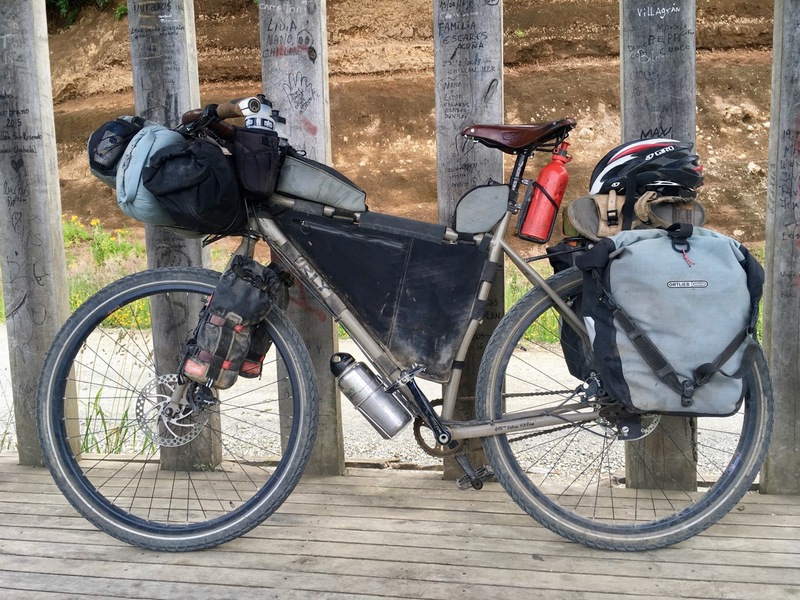 I had chosen a touring mountain bike and had used a lot of bikepacking bags but couldn’t manage without a rear rack and a set of classic Ortlieb panniers. Or so I thought. As I made my way up and down the seemingly endless mountains of the Peruvian sierra, my mind was constantly fixated on what I could lose from my panniers to make my life easier. Being far more accustomed to riding a 9kg road bike on asphalt, grinding a 45kg fully-loaded touring bike up dirt roads was somewhat frustrating at times, not to mention a little tiring. As I made it to Huaraz, I was aware that I was passing my first great opportunity to make the leap to a lighter setup. Paul Griffiths (The Ride South) had ridden Alaska to Ushuaia a year or two earlier and had made the switch to a bikepacking approach. In fact, he had embraced it so much that, as his trip came to an end, he had founded a company (Alpamayo Designs) making bikepacking gear whose factory was in Huaraz! Needless to say, at that time, I couldn’t figure out what gear I would lose from my current luggage to make the necessary reductions for a minimalist approach. That, and I was still a little too attached to the luxuries that I was carrying with me such as my small folding chair and various ‘what if’ clothes. I did manage to lose about 2kg at that time though, sending home a small bundle of items that were superfluous to requirements. My next re-assessment came in Cusco when I first met Scott (Spoke and Words), an American who had ridden from Alaska and, being passionate about mountain-biking and riding interesting trails, had dumped the panniers too and made the switch. What’s more, he was essentially riding the same bike as me. Again, though, even with an example in front of me, I couldn’t see what I would lose from my setup to make the transition. Or perhaps, to put a finer point on it, I wasn’t quite motivated to make the necessary sacrifices. Fast forward to Argentina and I finally got a chance to ride with Scott for a few days. We rode pretty hard and it felt great to push my limits a bit. I was also coming to realise that, whilst it had been nice to have some easy-going asphalt to cruise along for a while in Argentina, I had really grown to enjoy the challenge and the tranquility of dirt roads and, whilst I was near some of the finest on the planet, I wanted to take full advantage of them. The opportunities for some really interesting and remote routes on the way South had re-ignited my excitement for the backend of the trip and I was finally motivated to make the jump. I won’t go into all the detail here of what I’m cutting out – I’ll update the ‘bike’ and ‘gear’ pages with details of that – but, essentially, I’ve lost the panniers and replaced them with a seat post bag and a small rucksack. Meanwhile, I’ve consolidated things (got rid of a whole load of kit) and strapped a bunch of stuff to the handlebars and fork. I’ve also upgraded the 2” touring tyres to 2.4” tubeless mountain bike tyres to give a little more traction off-road, a bit more shock absorption and much better puncture protection. At a guess, I would say the whole bike (and rucksack) probably weigh around 30-35kg now, without food and water!